In the XIIIth century, a goliard (goliart, gouliar, gouillard), is a glutton, a gobbler, a debauchee. Goliardie, means gluttony, gouliardoises are lecherous women. And yet, in those days, the word goliard is also applied to students, clerics, troublemakers, unruly or foul-mouthed characters. We owe them a kind of poetry so free-thinking and licentious that the council of Sens, in 1223, ruled that those ribald clerics (ribaldi) from the familia Goliae should have their hair immediately shorn off. The council of Trier, in 1227, forbade all these trutannos («hoodlums») et alios vagas scholares autgoliardos («and other vagrant students or 'goliards'») to sing at mass. The Latin word gula («mouth») may have given their name to the Goliards, or else it might be the French word gole («trap, shout, spoken word»), or even the Provençal verb gualiar, «to deceive»... They claimed allegiance to a leader, Golias episcopus, «bishop Golias», a legendary character whose name has sometimes been likened to that of Goliath the giant. And then Saint Bernard of Clairvaux in his CLXXXIX letter to Pope Innocent, denouncing the new ideas of Abélard, that «angel of Satan», referred to him as Golias! In his 1910 book, Les Jongleurs en France au Moyen Âge, Edmond Faral conjectures that «after this letter, many satires were published against Rome (...) which bore as a heading the name of Golias». The poetry of the Goliards, in Latin, sometimes in German or in French, is known to us through various collections (Cambridge, Basel, Saint-Omer, Ripoll in Catalonia...) the most famous of which was rediscovered in 1803 in the library of the monastery of Benediktbeurn (Upper Bavaria). Now kept in the Bayerische Staatsbibliothek in Munich (codex Latinus 4660), the manuscript was copied between 1220 and 1250, and published in 1847 under the name of Carmina Burana («songs of Beuern»). Many poems have melodic indications, neumes without lines or keys, which requires from the performer a good deal of personal interpretation. And yet, for about thirty of these poems, other sources are available in which the music is written on staves, like in the Florence or Wolfenbüttel manuscripts. 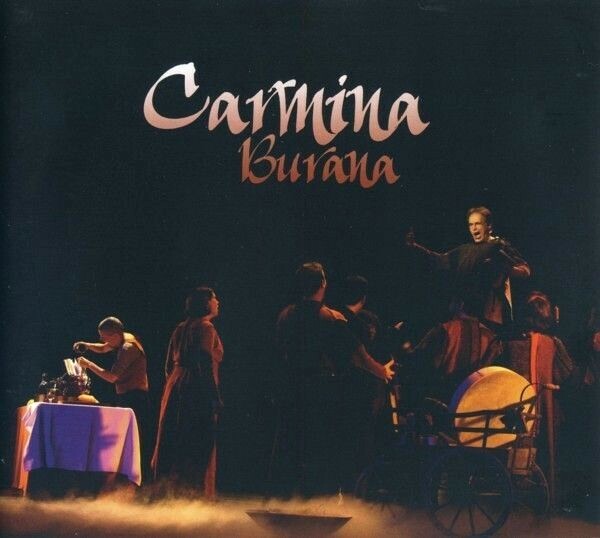 Carmina Burana is far from being a collection of bawdy songs only. Many of the Goliards are learned clerics, as well as brilliant writers. The first fifty five are moral poems and deal with miserliness, the improvement of humankind and its conversion; then come the love poems, the poems in praise of gambling and wine, and the collection ends with two religious plays dedicated to Christmas. The Carmina Burana collection is a compilation of two hundred and twenty eight poems, usually by unknown writers. However, it includes works by Minnesänger such as Walther von der Vogelweide (CB 151), and by French authors: Gautier de Châtillon (CB 3, 8, 19...), Philippe le Chancelier (CB 21, 27, 34, 131...), or Pierre de Blois (CB 33 (? ), 67...). All of them have in-depth knowledge of classical literature. Their poems are literally crammed with lines from Horace (CB 8), Ovid, Juvenal, the pseudo Cato, and there are quotations of Aristippus of Cyrene, one of the founding fathers of hedonistic materialism, in a dialogue with Diogenes, or Epicurus, Cicero and Virgil. The philosophy of Epicurus is held up to ridicule, much as it was in antiquity. Epicurus the sage, who used to live on bread and water (and a little cheese on festive occasions) is presented as a worshipper of the belly, «that god whose temple is the kitchen» (CB 211). And yet, a line from the song In Taberna quando sumus seems to recall one of the basic principles of the Epicurean doctrine: «Nobody fears death». Christian civilisation was fearful of Epicurus. Out of his three hundred scrolls, only three letters and a few maxims are left! Montaigne writes: «It is quite sure that, in the very first times when our religion started to gain authority over the laws, a number of zealots waged war against all sorts of pagan books, which was a wondrous loss to men of letters. I deem this disorder to have been more deleterious to letters than all the bonfires of the barbarians» (second book of Essays, chapter XIX). Diogenes, though, is taken very seriously, and the song Aristippe quamvis sero (CB 189) ends up with a set of sound moral prescriptions that would have befitted a stoic philosopher: «If you really want to be a cynic, take leave of the court». Christianity then felt close to stoicism and gladly welcomed its demanding austerity. Thus we cannot wonder at the reference «to the wisdom of Cicero and Zeno» (CB 31). The latter, of course, is not the disciple of Parmenides, Zeno of Elea, but rather Zeno of Citium, one of the founders of stoicism who died, intentionally, it seems, by... holding his breath! All mediaeval authors love quoting The Distichs of Cato. Dionysius Cato, at the time of Diocletian, had written a manner of handbook of moral doctrine in imitation of the sentences of Publilius Syrus (1st century). The morality songs in our collection never fail to recommend the perusal of The Ethics of Cato (CB 19). And yet the written style of Gautier, who rose up against the Goliards, was quite close to that of those very jongleurs he «hated to death»! Playing and singing Carmina Burana means following the great lyrical thrust imposed by the Goliards, blending respectfulness and freedom, appropriating rhythm, melody, instrumentation, switching from morality to debauchery, from praying to joking. Isn't this short poem in genuine gibberish a satanic formula? 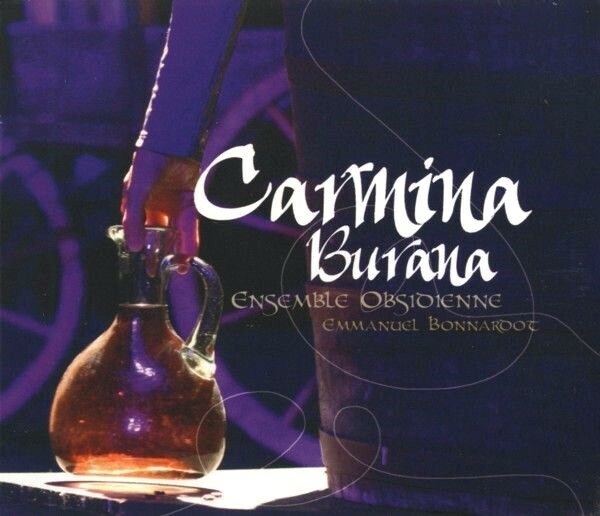 In July 2009, at the request of Laurent Hochard, director of the «Voix et routes romanes» festival, Obsidienne created the musical show «Carmina Burana» in its mediaeval version, at the church of Ottmarsheim, in collaboration with the Richard Gacquelin dance company. 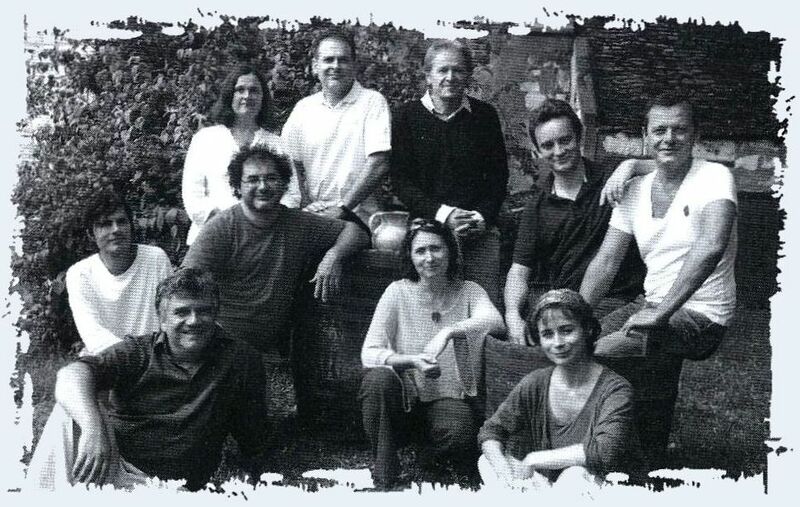 The show was repeated at the town theatre in Sens in October 2009, as part of the programming of resident music ensemble of Obsidienne in the town of Sens in Burgundy, with guest appearances by Claude Henry Joubert and the dancer Anna Pietsch. The show was directed by Pierre Tessier with lighting by Christian Mazubert and costumes by Danièle Barraud. The theatrical dimension of the work that Obsidienne offers on stage also appears in a few passages of this recording, such as the «tavern» atmosphere, the spoken text «Weep over what is deplorable», or even the song «Exiit diluculo rustica puella». For this interpretation of Carmina Burana, Obsidienne will make itself angel or devil, monk or Goliard. 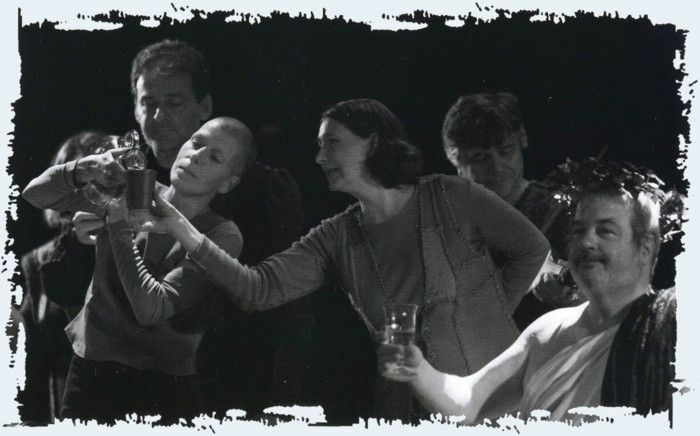 As a band of «jongleurs», versatile artists, the performers liven up the pieces with cheeky humour and cheerfulness; as well as subtle and refined, our interpretation must needs be explosive, farcical, humorous and joyful, thus illustrating the words of St Paul: «For the wisdom of this world is foolishness with God». of the pieces as restored by René Clemencic.